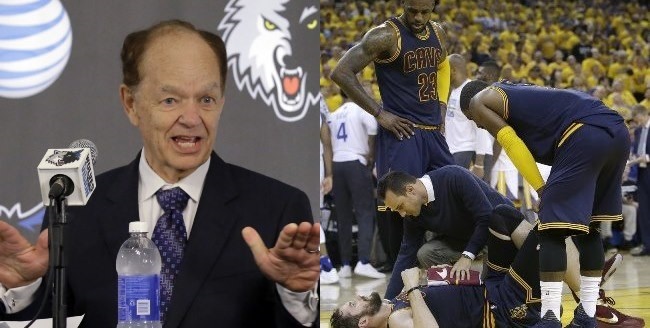 Looking back to an appearance the Timberwolves owner made at the 2014 Minnesota State Fair, it’s almost eerie to see how much Taylor predicted the future. The months (years?) leading up to the Timberwolves trading Kevin Love to Cleveland in the summer of 2014 weren’t exactly ugly. Messy is probably a better word. Love clearly was tired of losing, and he more or less forced the Wolves’ hand. Flip Saunders made the best of a bad situation, extracting Andrew Wiggins from the Cavaliers as a centerpiece of a Love trade. Love was coming off a season in which he averaged 26.1 points and 12.5 rebounds for a Wolves team that won 40 games. He was just shy of his 26th birthday when the trade happened, and many assumed he would be a natural fit as part of a “Big Three” on a Cleveland team poised to make championship runs. Love missed 112 games in his six seasons with the Wolves. To be fair, he’s only missed 12 regular-season games in two season with the Cavs. But he’s also fought lingering knee and back problems … and missed most of Cleveland’s run to the finals last year (where the Cavs lost) with a dislocated shoulder … and missed Game 3 of this year’s finals (when the Cavs won in a rout) with a concussion. Do you think Cleveland is happy to have five years and $110 million invested in Love? I haven’t watched closely enough to know if Love consistently gives a better effort on defense than he did with the Wolves. I do know the narrative that Love is a bad defensive player has followed him — and continues to be proven in stories like this one about how teams have exploited the pick-and-roll defense Love and Kyrie Irving play. Whoa, this last one is like “Back to the Future/time travel” accurate. If I had access to Taylor’s office, I’d inspect it for a Gray’s Sports Almanac, 2000-2050 version. While LeBron still takes the biggest share of the heat as the best player on the planet, Love absolutely gets hammered when things are going poorly and largely forgotten when things are going well. And Love knows it. “It’s never enough,” he said recently. If the Cavs lose this series to Golden State, get ready for a raft of “Cleveland needs to trade Kevin Love” stories. He basically has two games to change the narrative — and even then, fair or not, it might not be enough.